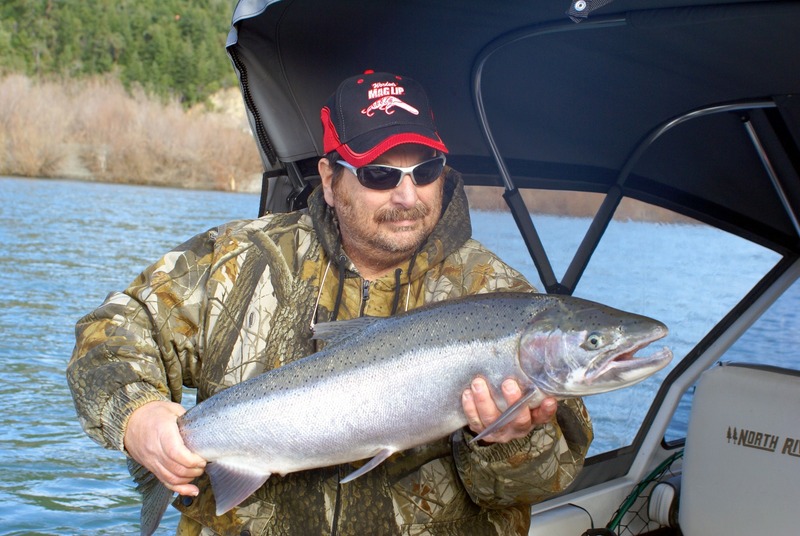 I always tell anglers that the first rains around the Christmas holiday signals the first major runs of winter steelhead to head up the Chetco River. But low, gin-clear water conditions have been the plague of Oregon south coast rivers this year. I was beginning to worry that the old Christmas adage was not going to come true this year. After plummeting to 850 cubic feet per second on Monday, the Chetco finally got its first major shot of steelhead caffeine in the form of badly-needed rain that raised the Chetco to 2,300 cfs on Wednesday, the day before the first day of winter. I hopped in my Soul and was soon road trekking to Social Security Bar. Of course, the Chetco was blown out to a certain degree, with coloration ranging from a cup of coffee with a splash of Irish Creme, to a very verdant appearance that looked like a freshly-picked four-leaf clover. That I expected to see. 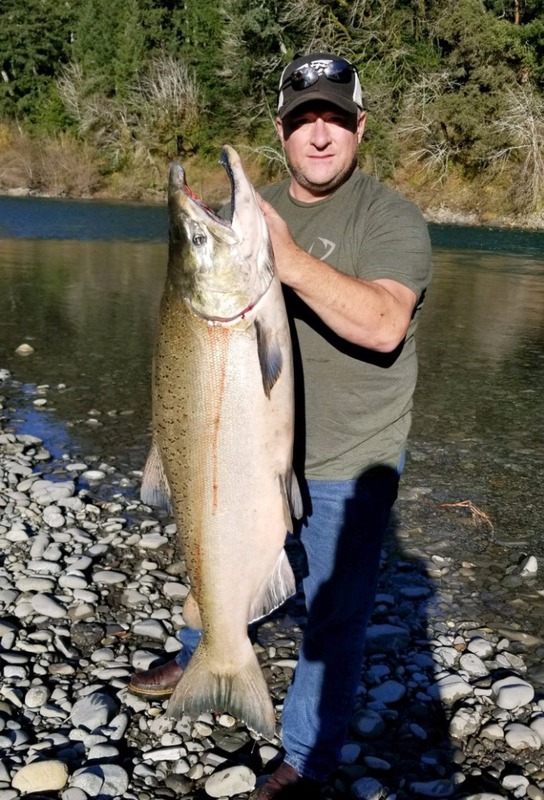 But what I didn't expect to see were anglers plunking at a moderate flow of 2,200 cfs on a very colored up river with 2-inch vis (on the Chetco, plunkers like their water flowing above the 4,000-cfs mark). But tell that to the seven steelhead that were caught by bankies plunking number 4 Spin-N-Glos at Social Security Bar on that day. Happy winter solstice eve! Once again, the rain around the Christmas holiday adage came to fruition. Thank you Mother Nature! After I had snapped a quick pick of metalhead number 7, you could hear another angler bellowing out the familiar cry of, "Fish on!" That was steelhead number 8. Landing that fish was nothing short of an exercise in cacophony. The fish was hooked near a point of land straddling the end of a willow line, and it kept trying to embed itself even further into thicker sections of the willows, making long parallel runs and giving the angler every molecule of its worth. It had inhaled a number 4 Firetiger-colored SNG, and by the way the fish was hooked, there was no way that the angler was going to lose that fish. He could have jack-poled the fish had he known that the hook was firmly imbedded in the roof of its mouth, where nothing short of line breakage would have lost the battle. But you never know how well a steelhead is hooked while it's making one of its signature line-peeling runs - do you? Personally speaking, I worry about the hook pulling loose on ever fish I hook. So on that day, just 5 days before Christmas, steelhead scales flew through the air and their fillets landed in the frying pan. Here's a very interesting point: 6 of those 8 fish were missing an adipose fin, the telltale signs of being hatchery steelhead. 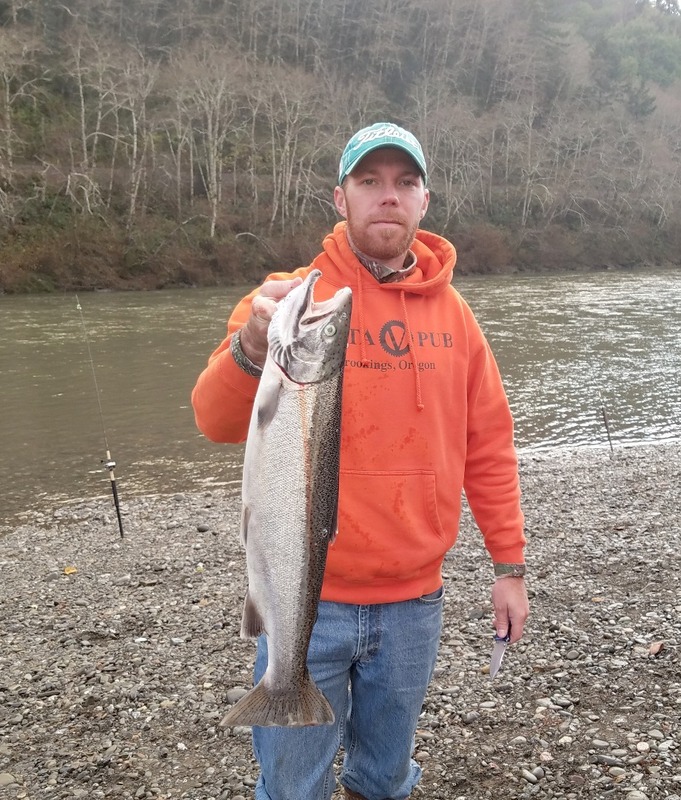 It looks to me like this steelhead season on the Chetco is looking quite hopeful, especially because peak season on the Chetco is somewhere between January and the middle of February. Everything will depend on how much rain the Chetco gets this year. According to the National Weather Service's Advanced Hydrological Predictions, Old Man Chetco is expected to rise again on Christmas day and on forthcoming days thereafter. Remember that beginning January 1, Oregon anglers will be allowed a 5 marine fish daily bag limit. Marine fish include rockfish, greenlings and cabezon (1 fish sub-bag when in season) and other species listed on page 81 of the Oregon Sportfishing Regulations. The 5 marine fish bag limit will not contain any sub-bag limits (except for cabezon in season). So when the first of the year rolls around, you can keep 5 black rockfish, 5 blue rockfish, 5 quillback rockfish, or whatever rockfish species suits your fancy and is legal to keep. Also beginning in 2018, In addition to the 5 marine fish bag limit, 2 lingcod with a minimum size length of 22 inches may be kept as well, for a total of 7 bottomfish per day. At this point in time and in 2018, anglers may also choose to fish outside of 40 fathoms using longleader gear for 10 suspended rockfish such as yellowtail rockfish and widow rockfish. This is an either/or fishery. Anglers cannot fish the longleader fishery and fish the regular bottomfish fishery in the same day. Next week will feature the longleader fishery and the people who started and developed it. 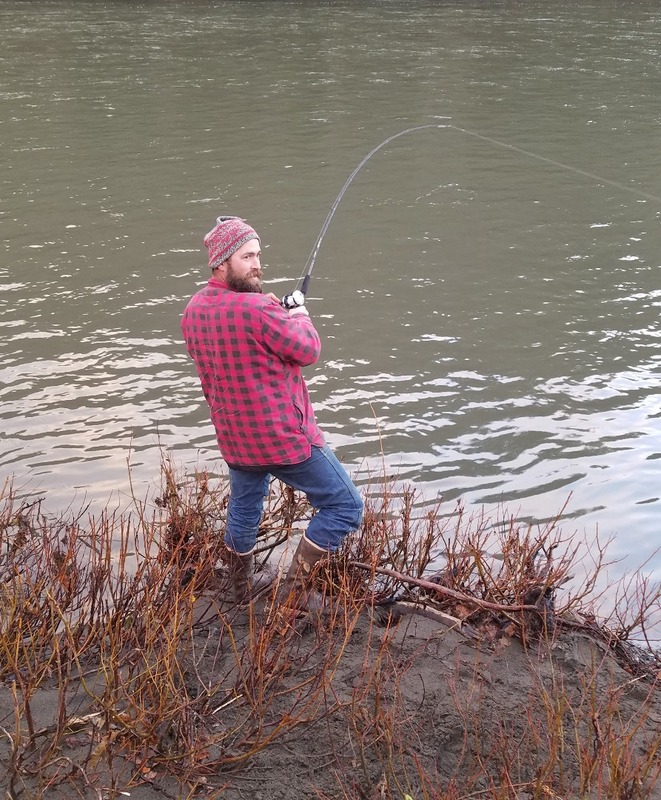 An angler fights a Chetco River winter steelhead last Wednesday while trying to steer the angry metalhead away from the willows. The steelhead bit a watermelon colored number 4 Spin-N-Glo. Photo by Larry Ellis.